Before: Piano wrapped in plastic bags and surrounded by tucked away stuff. What should have been a simple and brief window renovation, turned out to be the Work-In-Progress from hell. The company doing the renovations took our windows out to do much of the work – such as changing glass, painting and carpentry – at their shop, and we found ourselves having to live with just some poorly fitting tarpaulin umbrellas over the empty windows for more than a month. Because autumn is now setting in here in Sweden, things got cold (the draft!) and damp in the apartment, and since we live by a fairly trafficked street it was also noisy. 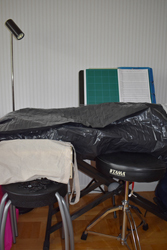 To keep my electric piano safe, I had to pack it in thoroughly and for more than a month I have been unable to do any serious writing work at home. After: Piano unpacked, connected to its outlet and played for the first time in over a month. 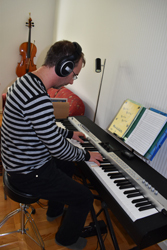 On the stand is the score for Guitar Pastime Suite part 1 “Pick Your Point”. Partly due to this abysmal renovation still not completed. Today I am finally unpacking my workplace! After tidying things up I plan on a composing spree this weekend. This year’s summer sale is over, but between 1st and 31st of December, there will be a Christmas-New Year’s Sale.